Love My Maids has a team of highly-trained professional maids who provide dependable cleaning services to Hurst homes and businesses. Since cleaning your home is a time-consuming task, leave it to our professionals to handle it for you. Our maids, who are all insured and bonded, know how to get your home looking its best on a regular basis. We offer routine cleanings that you can set up each week, every other week, or on whatever schedule that works best for you. If you just need a good spring cleaning, an occasional deep cleaning or cleaning for move-ins and move-outs, we’re here to help. Our maids have a 32-point checklist that they use to make sure that they fully clean your house. Our maids also speak English, so you don’t have to worry about any communication problems. When you have your home professionally cleaned on a routine basis, you’ll have a lot more time to do what you want. You can spend this extra time relaxing or going out and about to different places in Hurst. This gives you a chance to explore your community more, support local businesses, and get to know fellow residents. You can take your time shopping at North East Mall or at the nearby shops. If you would rather spend your free time outside, head to Hurst Community Park, Chisholm Park or any of Hurst’s other local parks. You can also enjoy Cajun cooking at Two Sisters, or treat yourself at Braum’s Ice Cream and Burger Restaurant. Fort Worth is also just 20 minutes away, and Dallas is about a 30-minute drive away from Hurst. If you want to spend your free time outside of Hurst, you can see what these larger cities have to offer. A clean office makes an immediate favorable impression on customers, which helps your business thrive. Having a clean office also means you’re providing your employees with a healthy workplace, which can boost productivity. Love My Maids in Hurst has office cleaning services available to ensure that your office stays in good condition. For your convenience, we offer flexible cleaning schedules, including bi-weekly and weekly schedules. We can work with you to set up a cleaning routine that best suits your business. Our cleaning team at Love My Maids does more than dust and vacuum your workplace; we also mop floors, take trash out and make sure that your office furniture shines with regular polishings. With our office cleaning services, you’ll also have fewer germs around your workplace. Our maids sanitize surfaces in high-traffic areas, such as break rooms, bathrooms, and kitchens. 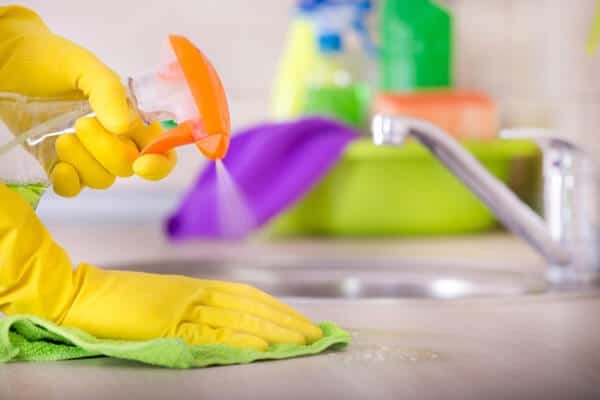 Having all of these cleaning services handled by our maids means that you and your employees can focus on staying productive at the office instead of having to take time to tackle these tasks. Love My Maids has a history of providing top-notch cleaning services in the Hurst area, although we’ve only been in business since 2014. Over the past few years, our team has shown Hurst homeowners and business owners that we’re dedicated to providing excellent, high-quality cleaning services. Our passion for cleaning also includes a commitment to helping our community. In fact, Love My Maids in Hurst is a Proud Partner of Cleaning for a Reason. This non-profit organization offers cleaning services at no charge for women who have been diagnosed with cancer and need help caring for their home during treatment. Love My Maids has received a lot of recognition for the great service that we provide. This includes a Best of 2016 rating from Thumbtack and a Top Rated ranking from Home Advisor. Our business is also a BBB accredited company. Customer reviews show overwhelming satisfaction with our services. Customers have been impressed with the professionalism and care that our maids provide with each cleaning. Our maids have also received glowing reviews for providing a valuable service for disabled customers who are unable to handle cleaning tasks on their own. If you’re looking for extra free time, contact Love My Maids in Hurst to book a cleaning at (817) 542-0347. We can set you up with regular weekly cleanings, bi-weekly cleanings, monthly cleanings, or even just a one-time cleaning. Our veteran-owned business strives to ensure that each customer receives the best cleaning services possible. This includes using green cleaning products, which helps cut down on indoor pollutants while also being better for the environment. Visit us online today to schedule your cleaning at your Hurst home or office. We’re also available to answer any questions you have about our cleaning services, our staff, our prices, or our company in general.